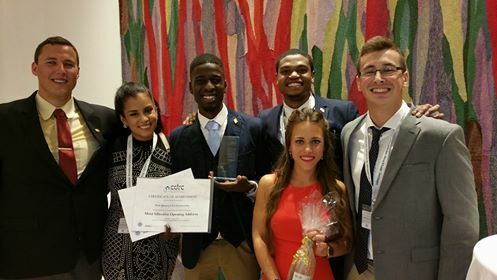 Recently, I conducted an interview with Ms. DeSoto about an event where two students from the Institute for Dispute Resolution [at New Jersey City University’s (NJCU) School of Business] won an award for Best Opening Statements at the Vienna Austria CDRC (Consensual Dispute Resolution) Mediation Competition. I didn’t know what Consensual Dispute Resolution mediation was, but before I got to that I wanted to better understand what the Institute for Dispute Resolution was. Brie Austin: Firstly, what does the”JD” stand for at the end of your name? That stands for Jusis Doctorate, which I earned at the Beasley School of Law at Temple University, along with the Master of Law in Trial Advocacy. What motivated you to start the Institute? Karen DeSoto : The idea came about while David Weiss and I were discussing ways to promote international commercial trade and commerce for the state of New Jersey, and subsequently a way to do so for the benefit of New Jersey City University. The Institute was what we came up with. How and when was the Institute launched? Well, we first went to the university president He was supportive from the start, and through collaborative energies we got it done, officially launching it at our first co-sponsored event in March 2015. The event was entitled “Ethical Issues in Business Mediation and Navigating your Client’s Concerns” and co-sponsored by the Hudson County Bar Association and Foundation, Justice Marie L. Garibaldi Inn of Court, New Jersey Hispanic Bar Association, and Judicial Arbitration and Mediation Services International (JAMS). It was a huge success attracting over 100 attorneys and former local, county, and state judges who earned two NJ/NY CLE ethics credits in an interactive program with top instructors. Topics covered party tactics, confidentiality, self-determination, informed consent, and mediation vs. lawyer “Ethics Codes” as applied. The program is fully subscribed. What is the purpose of the Institute? The New Jersey City University Institute for Dispute Resolution is an entity of the University Business School, and it aims to promote international negotiation and mediation techniques to manage disputes in cross-border commercial, investor-state and general conflict resolution forums. It engages in applied research — in the fields of negotiation and mediation studies — to apply these principles. Our mission is “to promote trade and commerce applying international mediation from a business school prospective and promote New Jersey as a place to conduct cross border disputes”. We have several key objectives to accomplish this, including, program initiatives, applied research in field of mediation, seminars and programs, exchange programs, field work, and publications Further, we engage in legislative policy initiatives. What type of legislative policy initiatives? For example, we contributed to piece of legislation — S602 –, which has received bipartisan support from Senators Sandra Cunningham and Tom Kean Jr. We contributed to the legislation — to address the lack of an enforcement mechanism for arbitration under the ‘New York Convention’ It is a corollary bill that would work in the framework of our current arbitration statute. I then appeared before the state Senate to testify on its behalf. What was this competition in Vienna, and where have your students competed? The CDRC (Consensual Dispute Resolution) Mediation Competition is held in Vienna, Austria. The students have been there twice to date, as well as another competition in Paris, France. How did the students fair in this competition? Leman Kaifa and Paola Andrea, two of our students from New Jersey City University, won Best Opening Statements during the competition. How many competitors are there at the CDRC? There were 32 teams from around the world, mostly law students, each team consisting of a law and business student, and a student mediator. They had to analyze a complex commercial set of facts and negotiate strategically. All of our students did a great job. We’re so proud of them all, especially Leman and Paola. They all competed at the highest levels. I have to note that David Weiss, my co-director, and professor Bob Margulies were there with me; all of us served as the student’s coaches. So it was very rewarding for us as well. Karen, think you for taking the time to speak with me today I’ve learned something new about international mediation, as well as how the Institute is impacting local business in New Jersey. At a time when Hillary Clinton broke the glass ceiling of politics, you are certainly a role model for young women. “Thank you for saying so. It was my pleasure.